Okay, L.A. haters, try this on for size. The above photo was taken in the hills above L.A. looking across Santa Monica Bay toward Santa Barbara Island -- one of the Channel Islands chain that sits off the Southern California shore. In fact, I think you can also see a sliver of San Nicolas Island on the right hand side of the frame, just above the horizon line. You may hate the city, but it's hard to be putting the hate on much of the surrounding scenery. BTW, this is an easy-to-reach spot. 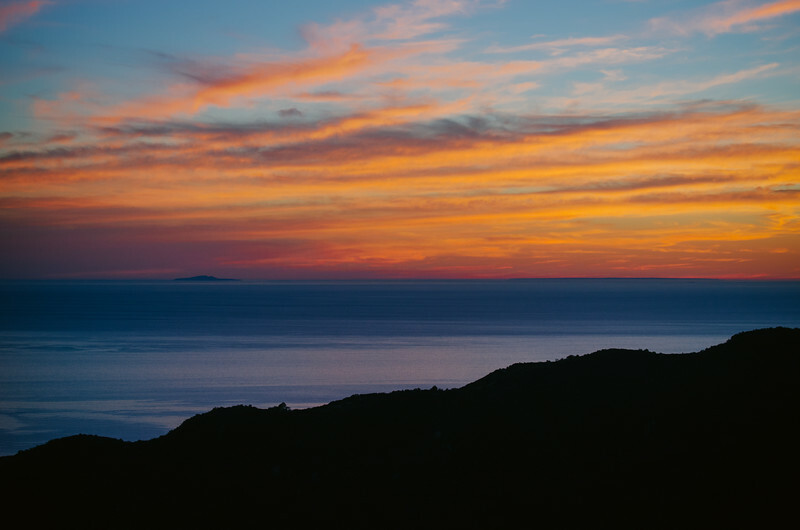 The photo was taken from the trail to Temescal Peak in Topanga State Park. The trailhead is in the Palisades Highlands; directions here. This was a tough photo and I underexposed it too much trying to preserve the sky and highlights. Processing was also tricky. I almost always use 'auto white balance' on my Nikon D5100, as I did yesterday; trying to adjust for color temperature usually results in weird looking colors. I also rarely change the white balance during processing - to my eye, the colors usually look accurate. In this case, however, I did play around with the white balance. My camera measured the scene at 4,050 Kelvins (the basic measure of color temperature). But the conventional wisdom is that the proper measure for sunsets should be in the 3,000 to 4,000 range. (Here's a good white balance tutorial). In this case, I fiddled with the white balance setting in Lightroom and took it down to the high 3000s. As a result, I got a bluer ocean and sky -- in fact, the ocean looks more blue in the photo than it did to my naked eye. One other lesson here: I shot in RAW. Always shoot in RAW if it's a photo you really care about. It's easy to change the white balance when processing RAW photos; you can't do that with jpegs. RAW also lets you fix exposure problems. Below is a photo I like but I was in a hurry and badly underexposed the subdivision. In Lightroom, however, I was able to bring the homes out of the shade a bit. It's hardly perfect -- but I was able to salvage something.